What's the #1 question you get asked when you're a vegan? I bet you already know - "but where do you get your protein from?". Literally every person asks me this after telling them I'm vegan for the first time. I don't mind sharing my reasons and, since becoming vegan, I've accepted the responsibility to educate my peers on plant-based protein. I'm passionate about nutrition, specifically plant-based, and love sharing all the ways to incorporate animal free protein into my diet. However, I also get plenty of questions from actual vegans about how I personally meet my daily protein needs. I won't lie, protein is not always on the top of my list in my meals. I always aim to have a protein component but it usually gets lost to the loads of veggies I consume. One of my 2018 goals was to up my protein intake but I don't like to eat the fake meats too often, especially because they aren't always particularly affordable. Plus, many of them have high salt content, which gives them a similar meaty taste. I started adding vegan protein powder to my post-gym routine to ensure I was getting closer to my necessary daily goals. Over the past few months, I have tried enough brands, types, flavors, and more to have a solid opinion on all of the products below. I have three varying powders, all with slightly different nutritional values and at different price points. I know being vegan can be expensive sometimes, but if you do your research it doesn't have to be! 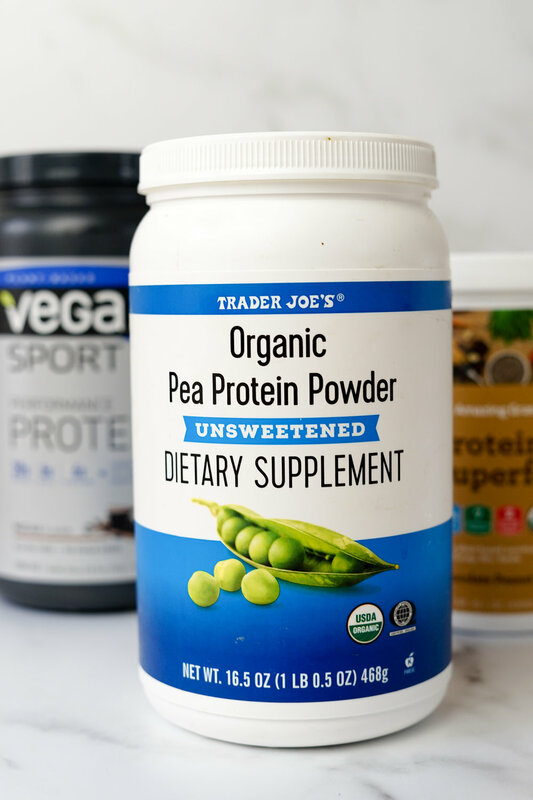 I hope my review and opinion of these vegan protein powders helps you find one that works for you and will be easy to incorporate into your diet! There are lots of ways to get plant protein when you're vegan but something like a dietary additive as simple as these never hurt anyone! When I first started using vegan protein powders, I bought this one because it was the most affordable option and a reasonable amount for the price. There are 20g of protein in each serving and only 130 calories (if that is something that's important to you). I don't think I've come across any other powders within this price range, either, so if you're on a budget I highly recommend this one. I will say that the vanilla flavor is much better than the unsweetened. This powder is very fine but also becomes extremely thick once added to a liquid. Make sure you shake it very thoroughly with plenty of water or whatever liquid you use otherwise it will be more like a paste than a shake. I haven't tried it yet, but I'm sure you can bake with this powder. I love mixing it into yogurt, smoothies, and oatmeal, too. If you don't like a powder's flavor but don't want to waste it, try experimenting by adding it to your food so you can't taste it but are still benefiting from it's nutritional values. 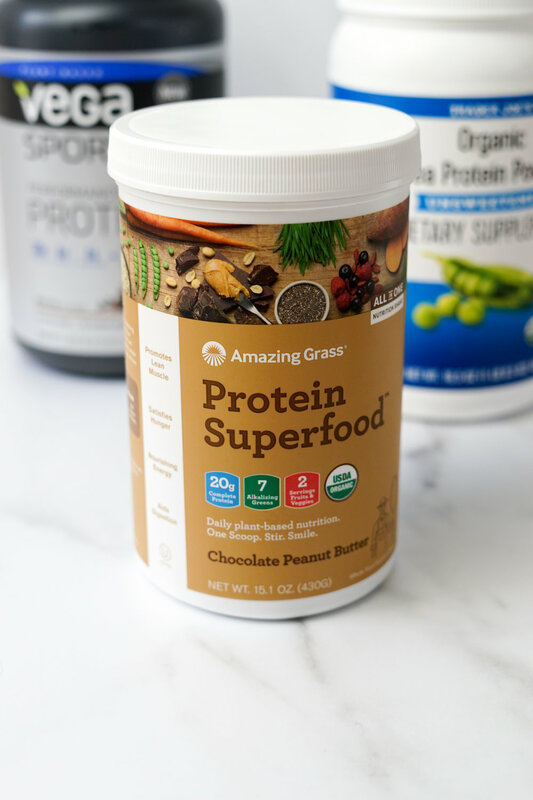 Out of all three, Amazing Grass's protein powder is my favorite. It dissolves easily, the flavor is amazing, plus it has two servings of fruits and vegetables in each scoop on top of the 20g of protein! This is the only one I've tried that mixes well with little effort, too. The Chocolate Peanut Butter flavor is also delicious if you have a sweet tooth, like me. Luckily, though, there are only 4g of sugar per serving, so you won't feel too guilty about eating chocolate and peanut butter for a meal! I do wish there were more servings in each container as there are only 10 in the size I bought. But you could easy stretch it by doing half scoops instead of full ones. I keep a small jar of this powder in my desk drawer for days where I don't really have time to go grab lunch but still want to eat something remotely healthy. I know Whole Foods sells Amazing Grass, but it is much cheaper to buy it from Amazon. If you want a lot of protein and are a regularly, physically active vegan, I recommend Vega's line of protein powders. They are packed with protein - 30g a serving! - and the tub size will last you a decent amount of time. I always feel full after a protein shake when using their powder and the flavor selection isn't bad either. I love the Mocha one and add it to cold coffee if I'm having it in the morning. They go great together and I get the caffeine kick I need. I will say my only complaint is they can be pricy. 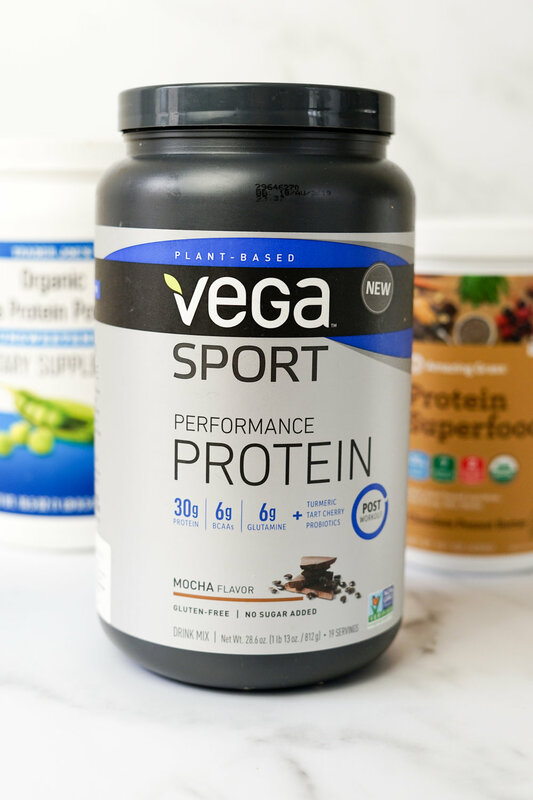 However, if you really need to get protein or just want a little extra in your diet, you will definitely meet your daily goals faster with Vega. I know you can find Vega products at Whole Foods, however, like the Amazing Grass powder, it's much cheaper on Amazon.